Massage stubborn knots from your upper back, all on your own! 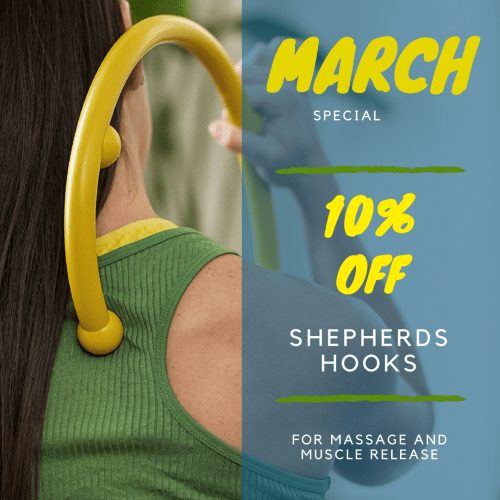 Leduc Physio always has shepherd’s hooks in stock. They are effective for relieving muscle pain in hard to reach areas, like between the shoulder blades. Place the round part of the hook over or under your shoulder, so the tip rests beside or above the shoulder blade. Move the hook along the shoulder blade to find tender muscles and apply comfortable pressure for 10-30 seconds. If you have more than a couple spots which need work, and the shepherds hook isn’t relieving chronic muscle tension or pain… it’s time for an appointment with Leduc Physio’s physiotherapists or massage therapists! Drop by our office to try out the shepherds hook today, and take one home for 10% off this month!